Polly peers quietly from her kennel, unsure of the great, big world around her. Being in the Animal Shelter seems to be a bit confusing for this 3-year-old Hound and American Pit Bull Terrier Mix. Her sensitive nature urges her to stay close and she constantly looks to the people and pets around her for reassurance. Polly has one of the most trusting souls; no matter how timid she may be in a new situation, she focuses on the humans around her. With a little time she always finds the courage to greet people and get the affectionate embrace she adores. 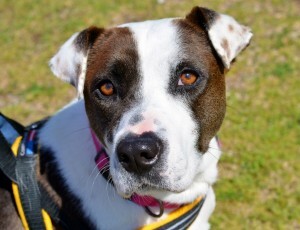 Polly is a medium-sized dog that will thrive in a home that can build up her confidence and show her just how wonderful this world can be. Yang is a lady of leisure, but she does have one job that she takes very seriously. She has made it her life’s work to fill a lucky home with as much love as possible. 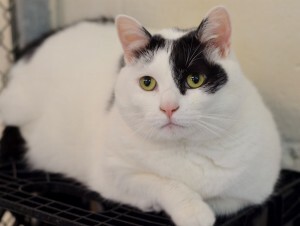 This 6 year old plumpy cat wakes up early every morning to make sure that her kennel is neat and that all the beds and blankets are ready for afternoon naps. Yang makes sure that every inch of her short black and white coat is spotless and ready for people to pet. She has spent years studying “The Art of Cuddles” and has mastered her lessons on “Relaxation with Humans.” The ultimate indoor house cat, Yang feels she is ready for her big promotion to a corner window in a forever home. She is ready to meet her new family today and will happily seek an interview with visitors to the Adoption Center. You could be one warm and happy hug away from bringing home your newest family member.